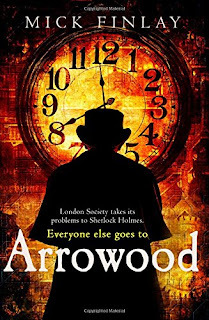 I love books that try to do something a little different and this debut from Mick gave me one hell of a treat as I loved the way he brought the old streets of London to life for me with not only cracking description but carefully woven humour. The principle characters work well together each one working off the other as thier clues to thier case are discovered proving to be something deeper than originally thought. Its carefully designed, the prose is sharp and when you add the Dickensian and Conan Doyle style of wordplay utilised all round gives it a rather authentic flavour. Finally throw into the mix a rather delightful style of storytelling alongside a set up that could easily lead to a series and all round I was a more than happy reader. I'll definitely keep an eye out for more books by this author in future.